The classic film favorite Star Wars wins new fans every day, and your child may be one of them. If your kid wants a Star Wars party, complete with themed food and decorations, to match their superfan status, consider these fun ideas for games to play at their party. Here you'll find descriptions of 8 Star Wars games. Read through the options with your child and see which ones pique their interest. Lightsaber dueling (have them spar with an adult for one minute). Solve a series of Jedi mind tricks (brain-teasing riddles). Repair the Droid (cut up an image of R2D2 into puzzle pieces). Set a timer and challenge players to put it together before time runs out. Hang a balloon from the ceiling (or from a tree branch). Let players take turns practicing hitting the balloon with a lightsaber. Once they have practiced a few times, blindfold them and see if they can hit it (using only the force to guide them, of course). To play this game, you will need four adults to assist with the “trash compactor.” Build two long walls out of cardboard. Draw trash on them. Have an adult hold up each side of the walls, so that there is plenty of space between them. Toss some trash bags filled with crumbled up newspaper between the walls. Have the players line up between the walls as well. Play some music and have the kids walk through the trash bin (between the two walls), step outside, circle the outer walls and walk back through. They will do this constantly as the music plays. Stop the music at random times. Every time the music stops, everyone freezes in place. The adults holding the walls take a step closer to each other, narrowing the space. Eventually, as the walls get closer, they will start to touch the kids. When they begin to touch, anyone caught in between the walls when the music stops is out of the game. Players on the outside have escaped and win the game. Write the names of Star Wars characters on name tags. Have kids wear them on their backs or foreheads (so everyone else can see who they are, but they don’t know themselves). Players will have five minutes to ask other players questions about their identity, but the questions must be answered only with yes or no. (Am I am male? Am I a hero? 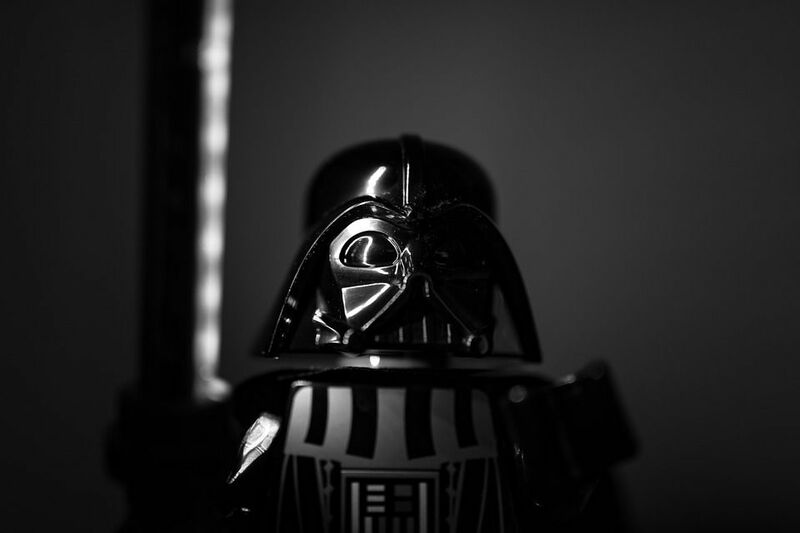 Is Darth Vader my father?) When a player guesses correctly, he may claim a prize. Inflate a bunch of white balloons. Use a black marker to draw Stormtrooper faces on them. Toss the stormtrooper balloons onto the floor. Call the kids into the room and tell them they must stomp the stormtroopers within two minutes to escape (pop the balloons with their feet). Set the timer and watch them stomp away. Place an action figure of Han Solo in a big bowl of water. Add food coloring to make it look like carbonite. Freeze it. When it’s time to play, take the Han Solo block of ice out of the freezer and remove it from the bowl. Place it on the ground outside and give players a spray bottle of warm water (for melting ice) and some spoons (for chipping the ice). See how long it takes them to free Han Solo. Write several Yoda quotes on index cards. Fold them up and place them in a bucket. Have kids take turns pulling a card from the bucket and reading the quote out loud in their best Yoda voices. Choose one player to be Princess Leia. Choose another one to be Jabba the Hutt. The rest of the players are Jedis. Have Jabba the Hutt sit between two lines that have been drawn in the grass. Have Princess Leia stand a few feet behind Jabba the Hut. Give Jabba the Hut a can of silly string. As Jedi’s try to cross past him, (without crossing outside the lines), Jabba tries to slime them (squirts them with the silly string). If a Jedi is hit, he is out of the game. If a Jedi makes it through, he saves Princess Leia. Players are then switched until everyone gets a turn to be Jabba the Hutt or Princess Leia.